Food really is fuel for our bodies and provides us with energy. In our last two posts, we have shared about Balanced Habits Life Nutrition at CBRC, a lifestyle program that helps individuals learn how to eat right, lose weight, and transform their lives. In the spirit of healthy living and eating, we’ll share tips for fueling our bodies in a healthy way in this blog post. Eat breakfast: Have you fallen off the breakfast eating wagon? Many people may not eat breakfast for different reasons. However, eating breakfast has many health benefits, including a lower risk of cardiovascular disease, diabetes, hypertension, and cholesterol. Start your day off with a healthy meal. Your body may thank you for not skipping out on breakfast! Fuel up with healthy foods: Focus on some great, healthy foods like fruits, vegetables, beans and legumes. Other healthy options include whole grains, nuts and seeds, fish, milk, and foods with omega-3s. Fill your body up with these foods – and you will not regret it! Eliminate unhealthy food: When you fuel up during the day, it’s important that you don’t fuel up on just any food! Choose to eat nutritious, healthy food (like those mentioned above), rather than other unhealthy foods. Therefore, it is best to stay away from foods that contain saturated fat, trans fat, dietary cholesterol and sodium. Think about these tips the next time you fuel up for the day! Remember: even small changes and steps can have a huge impact. Connect with Personal Training for more healthy eating habits and advice! If you forget to grab food or a snack at home – stop by the Deli at CBRC! 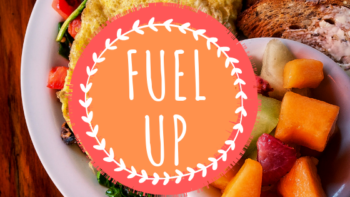 We have everything you need to fuel up!